For the sake of continuity, we sure to check out Part One of our trip to Waiheke Island! Here’s a quick recap: We took a 40-minute ferry ride across Auckland’s Waitemata harbour over to the island, and checked into the fantastic Breakfast On the Beach Lodge in Huruhi Bay. All in all, it was a great introduction to what Waiheke has to offer. 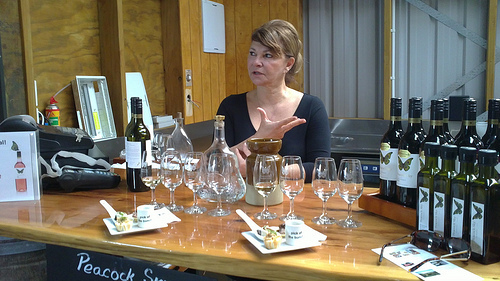 Today, we’re taking a tour with Waiheke Island Wine Tours. Naturally, wine is what Waiheke is the most well-known for. The island is only 92 square kilometres, but is home to 20 vineyards!! This is paradise for a wine-tasting trip. There are few places in the world where you have so many diverse options right on your doorstep! 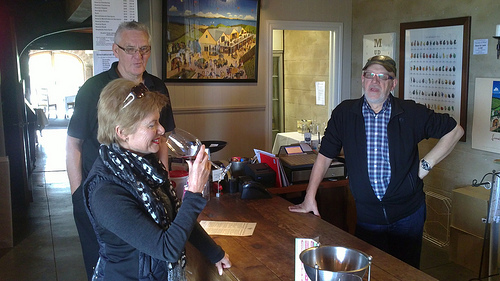 Owner/operator Wayne Eagleton specialises in small groups for this wine tours, which is exactly the boutique experience we’re after. He arrived right on time, and in a beautifully air-conditioned van. 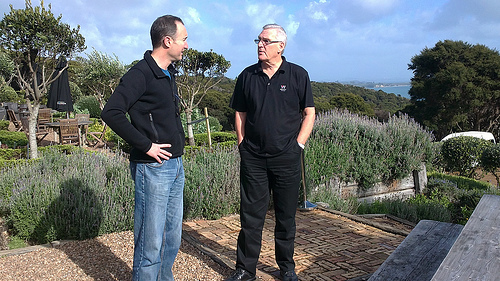 We soon learn that Wayne is one of those ‘true-blue locals’ of Waiheke Island. He has all the inside knowledge you would want on a tour like this, plus he has a great nose for Waiheke Syrah! By choosing this tour, we’re seeing far more of Waiheke Island than we would by driving ourselves. We can just sit back and relax in comfort. 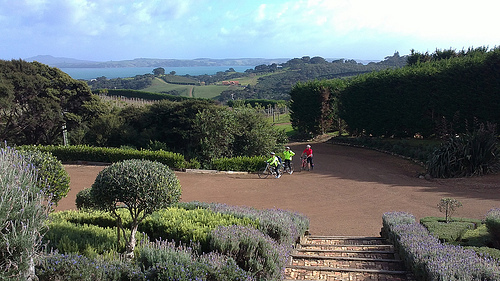 Our first stop is the Mudbrick Vineyard, which is one of the most popular on Waiheke Island. It’s here we learn that little ole Waiheke is home to 5% of all New Zealand weddings! With these amazing vineyard venues and scenery, it’s not hard to see why. Apparently, there’s a 3-year waiting list for the Mudbrick! 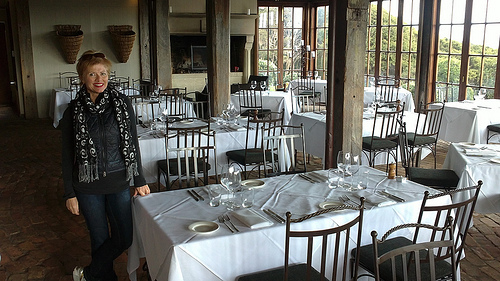 The actual vineyard building has a stylish, rustic dining area. It’s rich with decorative wrought iron light fittings, pristine white tablecloths, and gleaming cutlery, but it’s not overwhelming. Reaching the top of the stairwell, we’re treated to a gorgeous vista of vineyards sloping downhill as far as the eye can see. 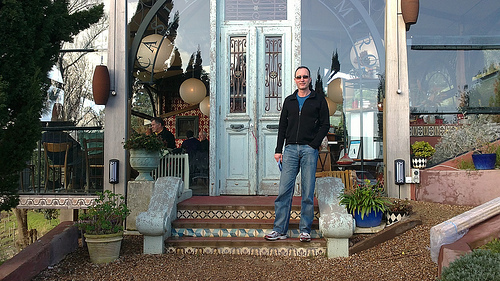 We’d like to give a big thanks to Mudbrick for choosing Bob Scott to showcase their wines. This guy is such fun! He’s totally focused on the wines and more importantly, on us! Can someone please tell me why so many vineyard staff are also talented artists!? Bob’s a photographer and an expert on Syrah, the predominant grape variety grown here. Bob shows no disappointment when I rave about the Viognier, but I notice him tensing up as I taste the ‘Hope & Glory’ 2009 Syrah (from the old vines area). Think Black Doris plums with the merest hint of sweet cherry – an absolute showstopper! Now we’re at Kennedy’s Point vineyard, which is totally organic in its viticulture practices. They also have a different approach to the traditional cellar door. Not only are we tasting, but we’re taking our glasses with us on a tour of the vineyard and the production area. Our lovely Irish guide is telling us about the traditional ‘footstamping’ that takes place at this vineyard every March. I really want to do this someday! I have a white dress that’s been hanging in my wardrobe for too long, and it needs a dye job! Connie, co-owner of Peacock Sky, is a force of nature. This little Canadian-Italian packs a lot of fire into her delivery. She’s ready and waiting, glasses lined up and the food laid out to match the five wines. We’re instructed to TASTE THE WINE FIRST, then taste the matching morsel of food prepared by Connie. She is a trained chef, and I’m getting a sense of Heston Blumenthal here. She speaks of pears marinated in merlot for 7 days, adding the vodka and ice cream and voila! Connie bombards us with information, but it’s all good. There are 30 wild peacocks on this 360-degree-view property – hence the name ‘Peacock’. Connie says the real owner is ‘Sky’, their beloved Border Collie. Hence the name “Sky!” We’re instructed to close our eyes and let our nose and mouth take charge while we taste the splendour of Peacock Sky’s 2010 cabenet. 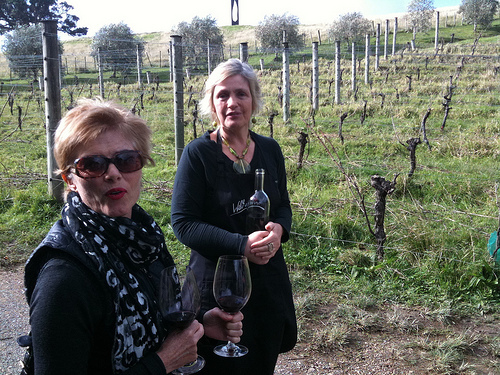 (This was an exceptional year for Waiheke Island wines) I think about leaving one eye open, but Connie insists. And you know what? It really works! Wayne has booked us a table at Casita Miro, a tapas restaurant on beautiful Onetangi Beach on the northern coast of Waiheke Island. We’re thrilled with his choice! Dining at Casita Miro is like sitting in a large glasshouse anywhere in the Mediterranean – except the accents are all Kiwi. We’re perfectly positioned to enjoy views of the vines and olive trees. Casita Miro has a very cool maitre d’ – it’s as if we’re all part of her extended family. Casita Miro is totally unpretentious. No snotty waiters here, folks! We chose a lamb tagine with whole figs, apricots, and Israeli couscous. Not everyone’s dressed up; a man opposite looks like ‘Fred Dagg’, complete with muddy gumboots. Good for him! Right on the dot at 3.30pm, Wayne collects us and takes us on another great scenic route back to the lodge. This tour really was the highlight of our trip to Waiheke Island. It’s time for the Travelling Travel Agents to plan their next adventure! Waiheke Island is the perfect place to go for travelers and wine lovers! Also the Island offers lots of accommodations for a comfortable and unforgettable travel.